Longer distance commuting by bicycle is perceived impossible by many. Not so for the Dutch. A combination of public transport and a bicycle is easy and very common in the Netherlands. That there are more bicycles than people in the Netherlands is in part due to commuters who have bicycles in more than one city: the city they live in and the city they work in. The distance between the two cities is bridged by public transport, mostly train. The distance covered in this video (‘s-Hertogenbosch to Utrecht) is about 50 kilometers (31 miles) one way. It takes less than an hour and that is about twice as fast than it would take by car for this particular route. The video shows how it is done on a winters day. Morning rush hour takes place in the dark during the winter months in the Netherlands. 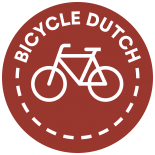 Does Dutch law also require bicycle parking, if it is not already required by social pressure and how dumbfounded people would be if a business opened with no intention of having bike parking. I’ve not become a regular reader of your blog, but every once in a while I check it out Part of the reason I don’t read it, because it’s not completely inspiring, but it seems merely like a dream scenario, not very likely, in the U.S. I read the “About” section and immediately grew curious about your commute, since you mentioned where you work and live, considering your stated background and your apparent interests and this blog. It would be about 25 miles, at the shortest distance, between the two city limits (‘s-Hertogenbosch to Utrecht). A quick search revealed this video, with the same two cities mentioned. There are always reasons for why things are the way they are…they aren’t simply so by chance and I suspect there are reasons why you have such an entire transit system, all the main components and complementary yet still important features (the bicycle parking is just astounding, from my perspective). I’m lucky if I can find even just a modest bicycle rack in any type of business or place of employment with a smaller number of patrons and/or employees (non-big box stores, convenience stores, offices). In Detroit proper, cycling is in a bit of a transition, and that there is such a use for something like a bicycle parking map (http://www.m-bike.org/blog/detroit-bike-map-and-parking/), because even though the riding conditions are more inviting in Detroit proper than they were say 10 years ago if there is a lack of racks or , it doesn’t matter quite as much, but it is still encouraging. This entry was posted on 9 January 2009 by Bicycle Dutch in Video post and tagged ’s-Hertogenbosch (Den Bosch), commuting, Utrecht.